refigure2 is an extension for Reinteract that allows the embedding of matplotlib plots. 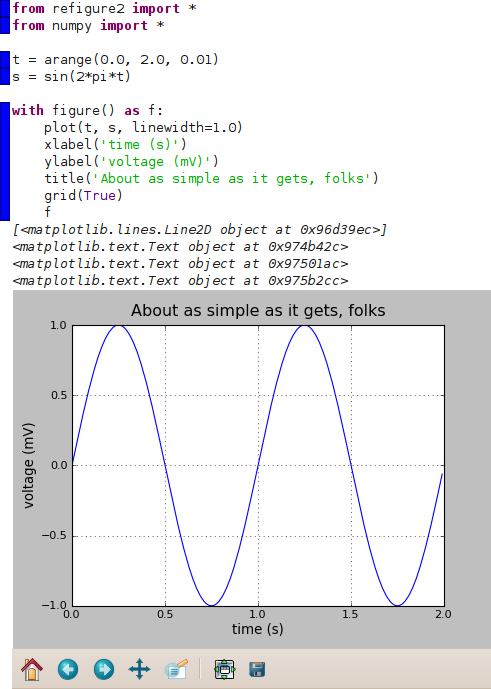 It does so with a syntax reminiscent of pylab, matplotlib's procedural (MATLAB™-like) interface. refigure2 is a spiritual successor to refigure, though the two share little code and less syntax. Entire figures are embedded in the notebook. This allows the creation of figures with multiple axes. Additionally, the inclusion of the figure's toolbar allows interactive panning, zooming, and more. Most† of the pylab commands are available. They are grouped together within a with block in order to operate on a single figure. Existing plotting routines based on matplotlib can be used unchanged, provided that they don't insist on creating their own figures for plotting. This means that refigure2 is compatible with toolkits like Basemap and mplot3d. See the refigure2 gallery [.tar.gz|.zip] for examples. Figures can be controlled by the keyboard, as standard matplotlib figures are. The figure must be clicked on to get keyboard focus. After loading your matplotlibrc file, refigure2 will read rc settings from files named refigurerc in the same directory as refigure2.py, in ~/.matplotlib, and (if you are using the output patch) in the notebook directory, in that order. Note that refigure2 adjusts figure.figsize and figure.subplot.bottom on load. It does not respect settings for them in matplotlibrc, but it does respect those settings in refigurerc. refigure.printdpi sets the DPI for printed figures when using the bitmap printing method. It defaults to 300.
refigure.keyboardcontrol sets whether the figure can grab keyboard focus when clicked and respond to keypress events. Defaults to True. If you are using the output patch, refigure.disableoutput sets whether output should be disabled by default inside with figure() blocks. Defaults to False, meaning output is printed. (This is a change from 0.3, where output was not printed by default.) Output printing may still be adjusted on per-figure basis with the disable_output keyword. The namespace within the module has been tidied, so from refigure2 import * doesn't pollute your namespace as much. A bug that could cause a freeze during printing has been squashed. Fixed a bug in creating the solo functions, so that future versions of matplotlib will be handled more smoothly. The redraw bug has been squashed, although another bug, related to reference counting, was uncovered. When using the GTKCario backend, printing is done directly in Cairo. Otherwise, if you have the Python Poppler bindings, printing is done through a PDF file, for full vector goodness. As a last resort, printing is via a bitmap. The resolution is taken from rcParams['savefig.dpi'], so bump that up to get good results. refigure2 can take advantage of a patch to Reinteract to manipulate the output that goes into the worksheet. More details. The locking mechanism has been fixed. Import the refigure2 module. For interactive work, I find it much easier to import it into the current namespace. refigure2 tries to avoid unnecessary namespace pollution. Multiple pylab commands can be grouped together in a with block. More details can be found in the refigure2 tutorial [.tar.gz|.zip]. † Most of the pylab commands work in refigure. ginput() is known not to work; others may also fail. show() and draw() don't work, but they aren't needed. figure() works differently in refigure than in matplotlib; see the tutorial for details. Bugs will be tracked on the github issue tracker. ginput() is known not to work. Other functions may also fail — please report them. Settings made in rcParams leak between open worksheets, even if they're not part of the same notebook. This is because modules are singletons in Python. Therefore, all open worksheets share the same refigure2 object, which contains rcParams. Reinteract must be completely closed to reset these settings (or you can manually tweak rcParams). I don't know if this is fixable within refigure2. As a work-around, rclocal can be used to adjust rcParams for the current figure only. refigure2 is known to work with versions 0.98.5.2–0.99.1.1 of matplotlib. Please let me know if it works (or doesn't) with other versions of matplotlib.